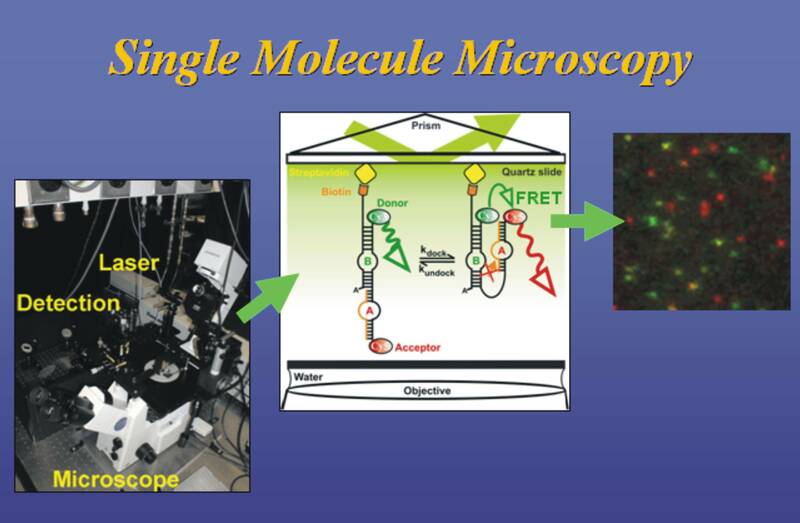 Characteristics of biological molecules may be determined by tagging a specimen on the surface of a microscope slide with fluorophores. These fluorophores emit light upon laser excitation, but by conventional means, background fluorescence can interfere with the desired fluorescent signal. 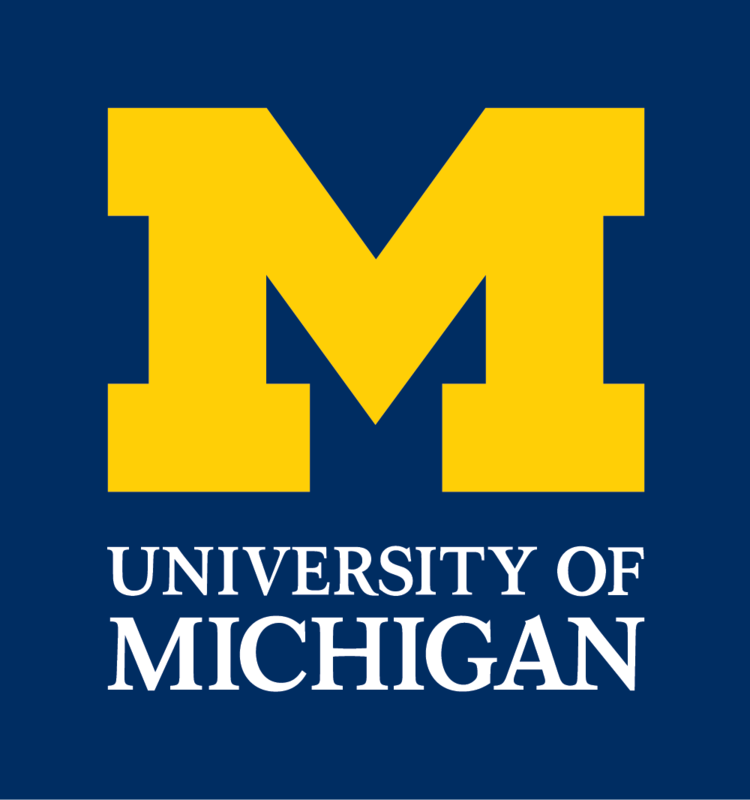 In order to improve the signal-to-background ratio, total internal reflection fluorescence microscopy (TIRFM) was developed here at the University of Michigan by Daniel Axelrod. The sample is illuminated by laser light that undergoes total internal reflection with the microscope slide. While the incident light completely reflects off the slide surface, it creates an evanescent field that penetrates the surface and decays exponentially with distance. Therefore, only samples within ~100 nm of the surface are illuminated, greatly reducing background fluorescence. Different techniques have been developed using TIRFM. 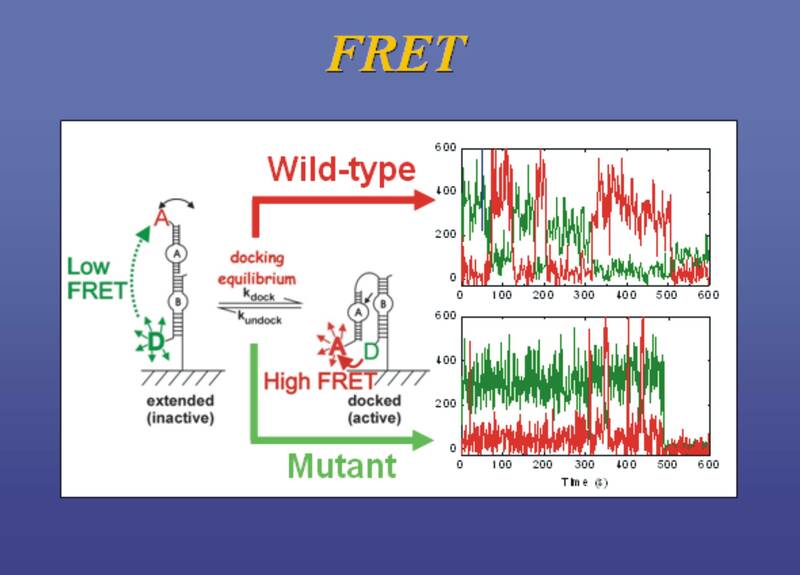 Two examples that this lab uses regularly are FRET and FIONA. Förster resonance energy transfer (aka fluorescence resonance energy transfer or FRET) is a phenomenon that takes place when you have two specific fluorophores in close proximity to one another. Via dipole-dipole coupling, a “donor” fluorophore (ex. Cy3) may excite an “acceptor” fluorophore (ex. Cy5) granted the two are within ~100 Å of each other. Because the amount of energy transfer is dependent on the distance between the fluorophores, FRET may be used as a ruler to give you information on the distance between two fluorophores. This technique is being used in the lab to study ribozymes, a riboswitch, the ribosome, and the spliceosome. Using the Rayleigh criterion, the best optical resolution that we may obtain is ~250 nm. However, the position of the fluorophore may be determined with low nanometer precision by locating the center of the unresolved spot using a Gaussian fit. 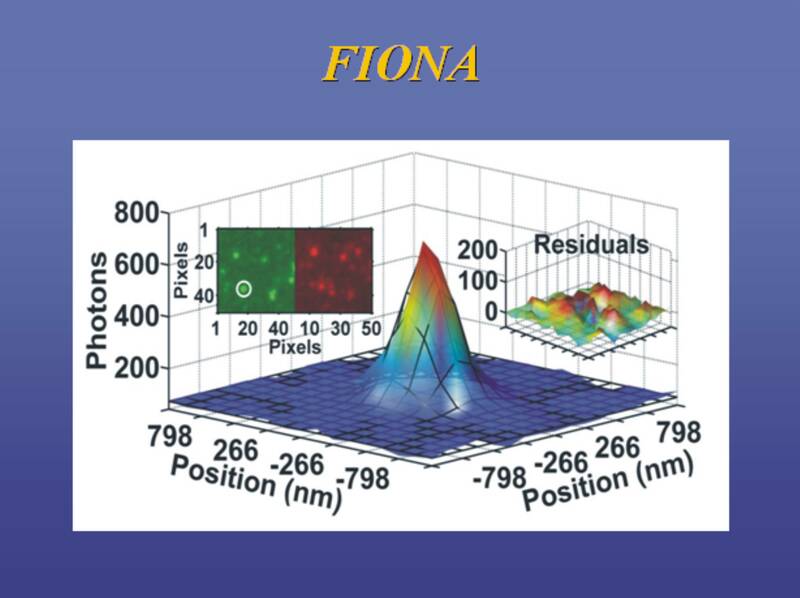 This “super-resolution” method is known as fluorescence imaging with one-nanometer accuracy (FIONA). By using this method over time, a trajectory of the fluorophore’s movement may be monitored making this a useful technique to use for the spider project.